This is my programme for the remaining workshops I am presenting this year on Friday mornings from 9:30am – 12:30pm at The Pottery Studio, 24 Old Kilcullen Road, Bryanston. These are demonstrating workshops and a large amount of material is covered. I suggest you bring a notebook. 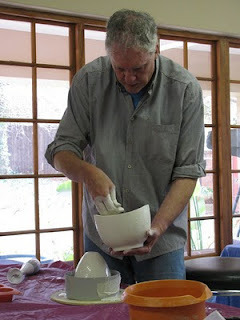 Decorating Techniques – green and bisque ware: August 6th. 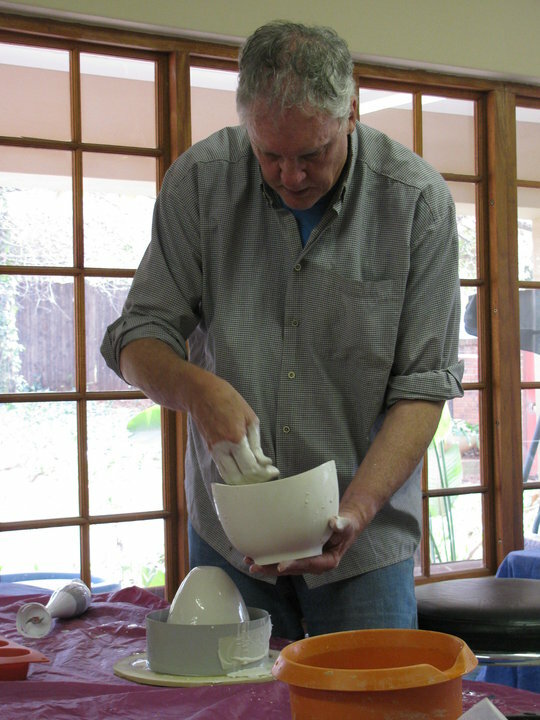 This workshop covers a variety of surface treatments which can be carried out on both green ware and bisque-fired ware. Among the techniques covered are a number of resist methods, etching on raw clay, underglaze and majolica, stamping, a new method of tube lining, sponging and banding. You will also be shown how to make your own underglazes, majolica colours and ceramic crayons. Creating a Professional Image: September 3. Are you doing enough to get your name and your work in the public eye? In this session we will look at various ways of how to go about promoting yourself and your work without outlaying large amounts of money. Also discussed will be the importance of creating your ‘brand’ and where to position yourself in the market. Paperplaster; the mould making revolution: October 29th. The revolutionary paperplaster method has changed my approach to mould making forever. Introduced to me by Sandra Black as taught by Trudy Golley this is an excellent introduction to basic mould making as well as a great new method for those more experienced in this area. This method uses much less plaster than is usually used for mould making resulting in lighter easier to manage moulds. I will also be demonstrating and doing my best to take the mystery out of slip casting. Glazes, everything you wanted to know: November 5. This workshop will focus on all practical aspects of glazing. Glaze application methods will be discussed and demonstrated as well as ways of keeping glazes consistent. Glaze on glaze decoration as well as ways of creating specialised surfaces using a number of techniques will be covered as well as the introduction of line blending, a method that offers you the opportunity to create your own glazes with no technical knowledge. Image Transfer on Clay: November 12. This workshop will cover ways of transferring images on to your work using a variety of methods. I will cover the making of your own decals using a normal laser printer as well as other methods of surface enhancement using photocopiers and printers, and other transfer methods, including a lithographic process that you can carry out on your own with few materials. Brilliant site. I want to know more about the different methods of transferring painted/drawn images onto porcelain/china.At the moment I hand paint (see facebook JMAChinaware) but need something to make everything less time consuming,to be able to repeat a design.S.A too far away from me here in UK! FADA Gallery: University of Johannesburg.